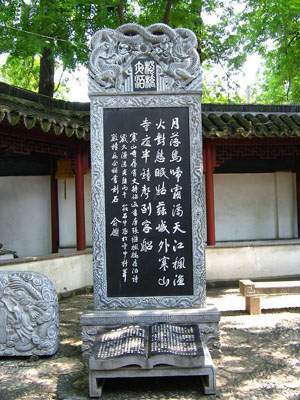 Located at the Fengqiao Town (fēng qiáo zhèn 枫桥镇), 5 kilometers from Suzhou City (sū zhōu shì 苏州市), Hanshan Temple (hán shān sì 寒山寺) was constructed during Tianjian era (tiān jiān nián jiān 天监年间) in Liang Dynasty (liáng dài 梁代), with a history of more than 1400 years. It was originally called “Miaoli Puming Temple”(miào lì pǔ míng tǎ yuàn 妙利普明塔院) and then changed its name into “Hanshan Temple” for it was said that Hanshan (hán shān 寒山) and Shide (shí dé 拾得), the famous monk during Tang Dynsaty (táng cháo 唐朝), had been the abbot of the temple. It was one of the ten greatest temples of China in history. 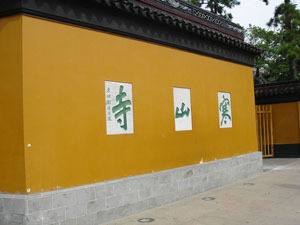 Hanshan Temple is famed because of the poem "A Night Mooring by Maple Bridge”(fēng qiáo yè bó 枫桥夜泊), written by Zhang Ji (zhāng jì 张继), a famous poet in Tang Dynasty. The poem describes the melancholy scene of a dejected traveler, moored at night at Fengqiao, hearing the bells of Hanshan Temple. 江枫渔火对愁眠。jiāng fēng yú huǒ duì chóu mián. 夜半鐘聲到客船。Yè bàn zhōng shēng dào kè chuán. 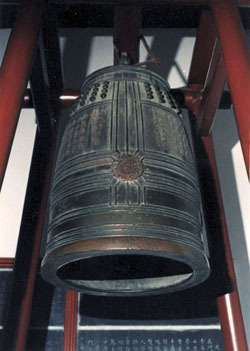 In the Great Buddha’s Hall in Hanshan Temple, there is a bronze Ding (dǐng 鼎), on the surface of which there engraved “一本正经"(yì běn zhèng jīng) and “百炼成钢"(bǎi liàn chéng gāng) on the back. There is a legend about these eight Chinese characters. It is said that the Buddhists and Taoists are quarrel with each other about whose sutra can endure fire. The monks put the Diamond Sutra (jīn gāng jīng 金刚经) into the fire in this ding but the sutra is okay. And then people engraved the eight characters to mark the thing. 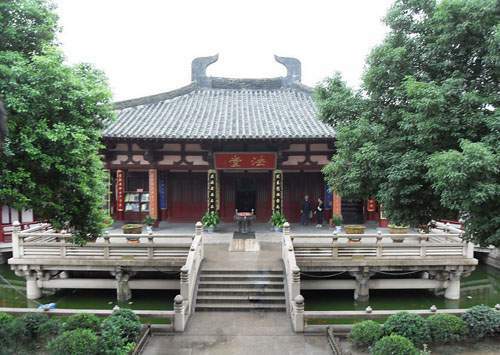 Like all the temples in China, there is Great Buddha’s Hall (dà xióng bǎo diàn 大雄宝殿) and Sutra Collection Pavilion (cáng jīng lóu 藏经楼) in Hanshan Temple. There is a statue of Sakyamuni in the Great Buddha’s Hall. However, different from the other temples in China, there dedicate the stone sculptures of Hanshan and Shide instead of Guanyin. To the south of the Sutra Collection Pavilion , there is the Bell Tower, with the shape of hexagon. Every year in the Chinese New Year’s Eve, people from home and abroad is gathering together to listen to the sound of the bell. It is said that all your trouble in one year will be driven away by the bell. Opening hours: 8:00 a.m. – 5:30 p.m.
Transportation: you can take bus No. 3, 6, 9, 17, 21, 31, 301 and tourist bus Line 3 to get off at the Fengqiao Stop (fēng qiáo zhàn 枫桥站).